The title grabbed my attention–part mystery/part Onion. Wait, no spoilers here. Check out the Consumerist story on a broken Swingline stapler. Lifehacker picks up another great use for the humble but mighty binder clip–keeping your kitchen sponge dry and grime free. 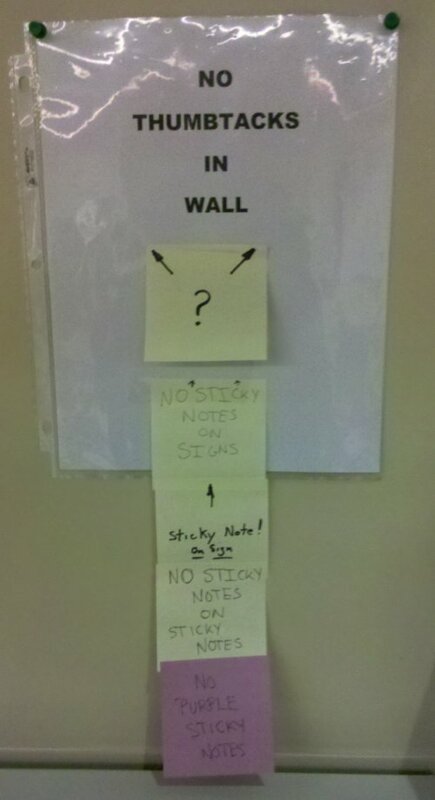 Wish the people would do this more often with office supplies. Replace Best Buy in this WSJ story with Office Depot/Max/Staples and you’ll see similar savings when purchasing from us. Teachers across the land can breathe a sigh of relief: the super popular Mead Primary Journal Creative Story Tablet (MEA09956) seems to be back in stock and isn’t selling out in two days, as they have been for the past few months. I was reading the wonderful Office Supply Geek blog the other day and came across his review of a battery operated eraser. I discovered we carry an uber-powerful model, the Koh-i-noor Rechargeable Eraser (KOHE1200) and it got me wondering what other unusual products we carry. How about a left-handed notebook? Along with half (or more) of the US Presidents I am left-handed and I don’t know if Righties can fully appreciate how painful it is to have a beautiful new notebook in front of you but as you put pen to paper, you have to deal with the spiral binding forcing your hand up from the surface. The notebook levels the playing field…at least until you start writing on the back of the first page. You might need to sit down for this one—on your old and uncomfortable chair. We are selling this wonderful chair for only $222! That’s $277 below retail price!